Weight: 55 lbs. Condition: very good! 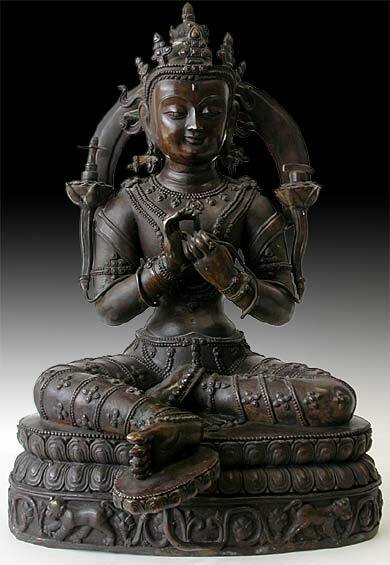 Manjushri is the bodhisattva of keen awareness and one of the original disciples of Shakyamuni. He is known for leading audiences of the Buddha into inquires of self through wisdom, intelligence, and realization. 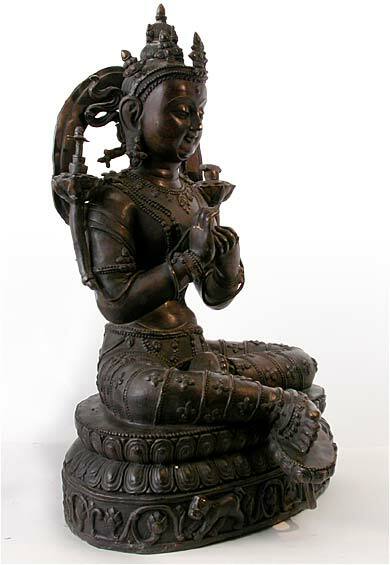 In this large bronze cast, the bodhisattva is flanked by his two attributes resting on open lotuses; the text of transcendental enlightenment (the Prajnaparamita Sutras) and the double edged sword of analytic discrimination (sword finial is missing). 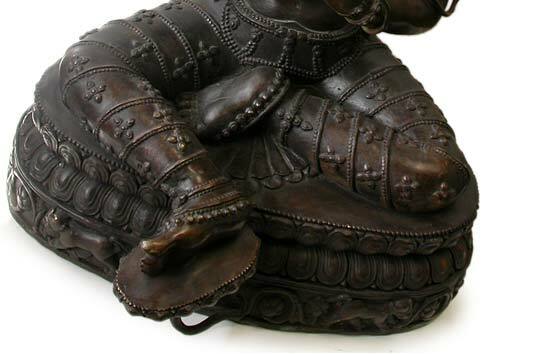 He sits in the royal ease pose, a compassionate charming expression radiate across his rounded cheeks. 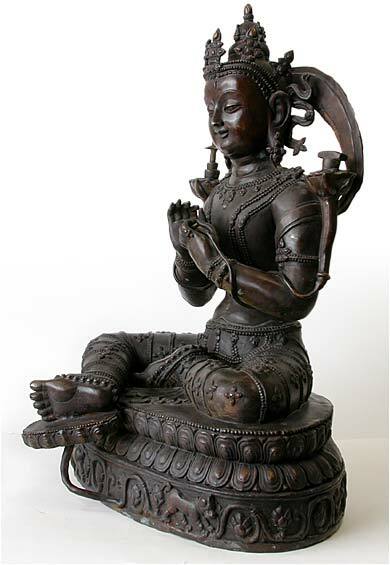 This version of Manjushri is stylistically related to Indian scriptural styles, particularly those developed in India between the 13th and 16th centuries, and shows remnants of Pala lineage in his crown and pedestal. 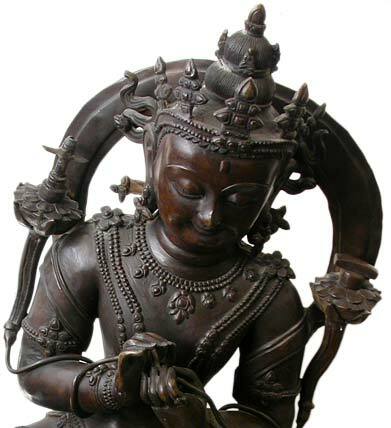 Its physical origins, closely related to sculptures in the Jokhang temple and Sera monastery around the Lhasa area in central Tibet, can be approximated between the 16th and 17th centuries. 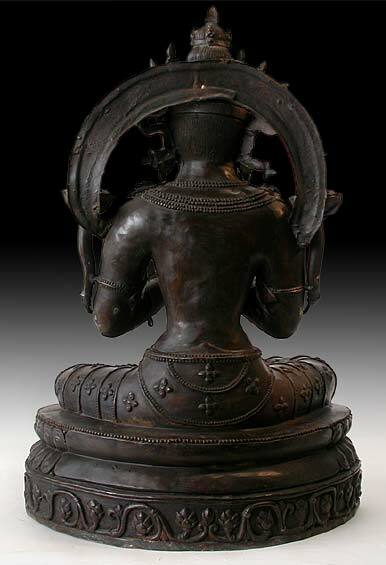 There is a very similar piece in the collection of the Asian Art Museum of San Francisco.